Santería, or Regla de Ocha as it is called by practitioners of the religion, is practiced in one form or another all over the world today. In general, it’s considered an Afro-Cuban religion which has its roots in modern day Nigeria and Benin. The name, Santería, is loosely translated as devotion to the saints, which rather than being the Roman Catholic saints whose names they often bear, are actually deities called Orichas. The use of Roman Catholic terminology and ideas began as slave owners attempted to force the religion on their slaves, who recognizing similar traits in some of the Catholic Saints, adopted their names to mask the worship of their traditional deities. Santería traces its roots to West Africa where the Yoruba people practiced the religion. With the discovery of the Americas, and the growth of the slave trade, the religion was introduced by Africans into the southern United States, Brazil, Cuba, Haiti, the Caribbean, and Trinidad. In most of these areas, the religion still has many practitioners even today. Upon arrival in the New World, the majority of Africans were forced to convert to Catholicism, but the forced conversion never really succeeded. Instead, practitioners of the religion adopted terminology and ideas of Catholicism in an effort to mask their continued adherence to their religion, leading many to have the misconception that Santería is a blending of the two religions. Most Africans continued to practice their native religion right alongside the Catholicism that was being forced upon them. Most Africans didn’t see the two religions as that different from one another, and they recognized their Orichas in many of the descriptions of Catholic saints. Today, many of the practitioners of Santería continue to identify themselves as Roman Catholic, and even baptize their children into the religion, while continuing the practices of their African-based religion. 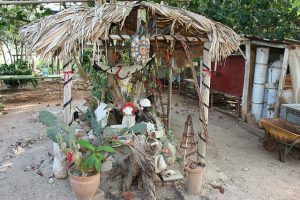 As their native religions were officially banned, Santería was practiced in secret so that they could avoid the religious persecution that they would have faced, and the social stigma that was attached to Afro-Cuban culture. Unlike the major religions of the world, which are primarily book-based, Santería was and continues to be passed on through oral tradition, passed on to each generation through private initiation ceremonies and instruction. Due to the fact that Santería is an oral religious tradition, it’s come to be thought of as an esoteric or primitive religion. In reality, it’s neither. The Yoruba were a highly civilized people with a very rich culture, and their religious beliefs were based upon philosophies that had a foundation based upon a very deeply ingrained sense of ethics. As an oral tradition, there is no set of written sacred text that can be referred to as the definitive teachings of the religion. This has led to some localization of religious practices and beliefs, as the teachings are transmitted by priests and priestesses. Santería differs slightly in one region where it is practiced compared to another, though the core beliefs remain the same. Much of what is believed and professed by those who adhere to Santería is unknown to outsiders, because adherents of the religion believe that their teachings are sacred knowledge to be shared only with those initiated into the religion. It is not an esoteric religion in the sense that its teachings are not limited to the chosen few, and they are very practical and easily understood by all. The religious teachings of Santería are geared toward helping the religions adherents to live in greater harmony with each other and the world. Many people wrongly believe that Santería is a polytheistic religion in which multiple gods are worshiped. There is some truth in this belief, however practitioners believe that there is only one supreme God. Very similar to the beliefs of the Roman Catholic Church, Santería professes that there are three representations of this god, Olodumare, Olofi, and Olorun, which can be thought of as the creator, the teacher, and the caregiver. This supreme God is the creator of many lesser gods called Orichas, which similar to the angels of Christianity, serve as intermediaries between people and God. They protect and watch over people, and report to Olofi on our activities. Santería teaches that the Oricha have a spiritual energy that they use to promote harmony and righteousness in the world, and that most of them at one time lived in human form. The practitioners of Santería practice devotion and worship of the Orichas, but they never place them above Olodumare. It’s believed that as many as 100 million people practice one form or another of Santería today. It’s recognized as one of the fastest growing religions in the parts of the U.S. Where there exists a sizable African-American Latino population. The religion is practiced by people of every race, educational level, and socio-economic background.